Grandma's Thanksgiving Turkey Stuffing. 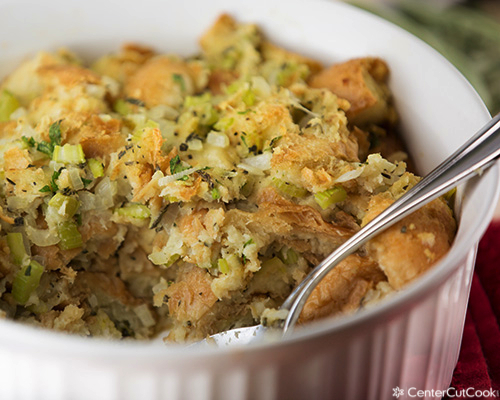 This is a long-time family recipe for simple and savory turkey stuffing. Bake it in the oven or in the turkey! In a frying pan, saute the onion and celery in the butter for 10-12 minutes, or until the onion and celery are tender. Place the bread cubes in a large bowl. Pour the butter, onion and celery mixture over the breadcrumbs and mix. Add the remaining ingredients and mix well. Spray a 2-quart casserole dish with cooking spray. Put the stuffing in the prepared pan. Bake at 350 degrees for 30-35 minutes or until golden brown. *I like to make my own dry bread cubes. Two days before preparing the stuffing, I cut bread into 1" cubes, then allow them to dry in a big bowl for about 48 hours. Stir the bread cubes once or twice a day so they dry out evenly. They shouldn't be "crispy", but slightly dry.